At a ceremony held at the Pakistan Aeronautical Complex (PAC), Kamra, last Thursday, Air Marshal Farhat Hussain Khan, the chairman of the PAC board, announced the launch of Falco UAV production in Pakistan in collaboration with Selex Galileo of Italy. Speaking on the occasion, the Air Marshal said the UAV co-production facility was a major step towards the long-term goal of self-reliance in military aviation industry. In the opinion of this blogger, it is expected that most Pakistanis will take pride in the nation's indigenous capacity to build and eventually use armed drones to put down the insurgent groups such as the Tehrik-e-Taliban Pakistan (TTP) who have unleashed a reign of terror in Pakistani towns and cities. Most such attacks cause large numbers of innocent civilian casualties and powerful, palpable anger against the responsible groups. Many Pakistanis will also see the development and manufacturing of UAVs positively in the context of Pakistan's competition with archrival India's UAV effort backed by the Israelis. But there are some elements in Pakistan who are irrevocably opposed to any military action by US or Pakistan against the Taliban or Al Qaeda and their allies. They will loudly oppose the the development, manufacture and use of drones against any internal insurgency, just as they have opposed the US drones attacking targets in Pakistan's FATA region. Fortunately, support for such groups on both the left and the right is rapidly declining, especially after the reported killing of Baitullah Mehsud who was seen as public enemy #1 by the vast majority of Pakistanis. While it is absolutely desirable for Pakistan to replicate US Predator capabilities and become self-reliant to avoid the political backlash when US predator strikes claim innocent Pakistani civilian lives, I doubt if it'll happen any time soon. While Washington has offered the UCAV (Unmanned Combat Aerial Vehicles) technology to its allies in Europe, it has been reluctant to make it available to Pakistan. Meanwhile, the Indians are likely to get the US armed drone know-how through the Israelis. The growing interest by Pakistani military and also foreign companies and governments has helped spawn several private Pakistani UAV companies specializing in air-frames, launch and propulsion, flight control, tele-command and control systems, signal intelligence, training simulators, etc. In addition to Integrated Dynamics, other private companies involved in UAV development and manufacturing include, East-West Infinity, Satuma and Global Industrial Defense Solutions. I think the current generation of Pakistani drones, including the Italian designed Falco, are not at all comparable to the larger US drones armed with powerful Hellfire missiles and sophisticated targeting technology which still results in serious errors. Regardless of the sophistication of drones, such errors can only be reduced by improving the accuracy and reliability of the human intelligence on the ground in FATA. The Pakistan Aeronautical Complex (PAC), Pakistan's chief aircraft manufacturing facility, has formally launched plans to part-produce the Falco unmanned aerial vehicle (UAV), a system already acquired by the Pakistan Air Force (PAF) from Italian company Selex Galileo. The project, unveiled on 20 August, will result in some of the Falco's parts being manufactured domestically to reduce reliance on Italian imports. The new programme marks an important step towards achieving an indigenous UAV capability - something seen as increasingly important to the PAF as it expands its role in the country's war against militants across North West Frontier Province (NWFP). Air Chief Marshal Rao Qamar Suleman, the chief of staff of the PAF, told Jane's earlier in August about the PAF's growing role in supporting anti-terrorism operations. UAVs are understood to be central to these efforts. Earlier this year, the Pakistani military successfully blocked an advance by Taliban militants in and around the northern Swat valley, with the PAF "carrying out several strikes on Taliban strongholds" following UAV surveillance, according to a senior Pakistani security official. The PAC chairman Air Marshal Farhat Hussain Khan said at the project's opening ceremony that continued use of the Falco "would greatly enhance the PAF's operational capability". Western defence officials in Islamabad told Jane's that Pakistan would eventually seek another armed UAV or work with Selex Galileo to develop a weaponised version of the Falco. "Today, the Falco UAV is principally for [reconnaissance] and intel-gathering purposes," said one official. "But I am sure the Pakistanis will eventually try to go for UAVs armed with missiles." The launch of the Falco project precedes the PAC's roll-out, expected later this year, of the first locally built JF-17 fighter, an aircraft jointly developed by the PAC and China's Chengdu Aircraft Corporation (CAC). The PAF plans to acquire at least 250 JF-17s to form the backbone of its fighter fleet. "The Falco UAV and the JF-17 both fit into the same philosophy, which is to reduce reliance wherever possible on imports," said the Western official. "Over time, Pakistan seems to be getting into handling more and more sophisticated technology." The Pakistan Air force has initiated the start of the Falco UAV Co-Production Project. The project was inaugurated at Pakistan Aeronautical Complex (PAC) Kamra last Thursday, with Air Marshal Farhat Hussain Khan, Chairman, PAC Board, was the featured guest at the occasion. Falco is an advanced tactical Unmanned Aerial Vehicle (UAV) designed by Selex Galileo, Italy, and will be co-produced by Pakistan Aeronautical Complex, Kamra. The Falco UAV will address the present and future surveillance and reconnaissance needs of the Pakistan Air Force. Speaking on the occasion, Air Marshal Farhat Hussain said the addition of UAV co-production facility would be a major step towards the long-term goal of self reliance in military aviation industry. He lauded the efforts of engineers and technicians of Pakistan Aeronautical Complex who had worked diligently for the last two years to establish the facility. He further stated that Falco UAV will greatly enhance the PAF operational capability. Earlier, Managing Director Aircraft Manufacturing Factory, Air Vice Marshal Aminullah Khan and Managing Director F6 RF, Air Commodore Nadeem Aslam, presented an appraisal of the project activities. The induction of this technology has opened a new dimension in the field of aviation manufacturing at PAC and would be used for other requirements of aviation industry. The roll-out of the first co-produced Falco UAV from Pakistan Aeronautical Complex should occur in the near future. Rs 1,118 crore after getting the nod from the Defence Acquisitions Council headed by defence minister A K Antony. The 1.13-million strong force has also projected a requirement of seven “troops” of the Rustom drones being developed by Defence Research and Development Organisation and Aeronautical Development Establishment in a Rs 1,000 crore project with Israeli help. As a MALE (medium-altitude, long-endurance) drone, Rustom will be capable of operating for 24 hours, with a 300-km range and a 10,000-metre maximum altitude. Army, of course, is already inducting the indigenous Nishant and Lakshya UAVs. Similarly, Navy’s case for two more Israeli UAVs at a cost of Rs 386 crore has also been approved, in addition to the ongoing Rs 1,163 crore joint project between Israel Aerospace Industries (IAI) and DRDO for NRUAVs (naval rotary UAVs). Navy is already using its UAV fleet of eight Searcher-II and four Herons for maritime surveillance up to 200 nautical miles. “To be operated from warship decks, the NRUAVs will further extend the surveillance out at sea,” said an official. Moreover, as reported earlier, Army also wants to induct a “large number” of man-portable “mini” and “micro” UAVs for short-range surveillance and NBC (nuclear, biological, chemical) detection in the battlefield. With Army planning to induct these miniature spy drones right down to the battalion-level by 2017, it’s keen they also be capable of carrying explosives for “hard kill” of “light targets”. Apart from regular infantry units, Para (Special Forces) battalions will also get these “stealthy” drones for covert missions beyond enemy lines and counter-terrorism operations. The armed forces had gone in for a major infusion of Israeli UAVs after the 1999 Kargil conflict and the 2002 Operation Parakram in the wake of Parliament terror attack. At present, they have over 100 UAVs, primarily Israeli ones like Searcher-II and Heron, as also some “killer drones” designed to detect and destroy enemy radars by functioning like cruise missiles. While the aim in the 11th Plan (2007-2012) period is to also induct armed drones like the American ‘Predators’, which are being successfully used to take on Taliban in Af-Pak region with their ‘Hellfire’ missiles, the eventual objective is to have full-fledged UCAVs (unmanned combat aerial vehicles). The plan, as of now, is to further boost the snooping capabilities of armed forces as well as fully-integrate UAVs with weapon platforms for delivering precision-guided munitions. What is the name of UAV in picture? Is Pakistan developing armed UAV? I believe it's Falco. There are plans underway to develop an armed drone in Pakistan. Check the video @ 54s, 1:29 US personal are wearing same uniform as Dawn picture ( One of which is also wearing darker color trousers and others are wearing the light color trousers just like picture).Even the color on the tail fins is same as in video. This is picture of Israeli Heron 2/Heron TP/Eitan High-Altitude Long-Endurance (HALE) UAV. The MALE UAV, which is based on the original Heron design, has a wingspan of just under 26m, length of 14m, and the aircraft has a maximum takeoff weight of 4650kg with a typical mission payload of 1000kg. The UAV is powered by a 1,200hp Pratt & Whitney Canada PT6A turboprop engine that powers a four-blade propeller. The long wingspan and the extra power give the UAV much better endurance, range and altitude than Heron 1.According to officials the Heron TP has an operational altitude of 45,000ft and is capable of missions of more than 36 hours duration. India have ordered around 50 Heron/Heron-2 out of which around 30+ are already delivered and 4 of these are used by IN(INAS 342 Squadron ) for maritime operations and plans to introduce another 8 Heron UAV for MPA operations. IN is procuring more Israeli Heron UAVs with three ground control stations and two ship control stations for Rs.3.5 billion after successfully deploying eight Searcher-II and four Heron UAVs. Heron-1 UAV is capable of flying for up to 45 hours at a time at altitudes exceeding 30,000 feet. It has a maximum range of about 3,300 kilometersm and can carry a maximum payload weighing 250 kg/ 550 lbs. LThe CIA can kill militants all day long. If the drone war in Pakistan drives the local people into al Qaeda’s arms, it’ll be failure. A new poll of the Pakistani tribal areas, released this morning, suggests that could easily wind up happening. Chalk one up for drone skeptics like counterinsurgent emeritus David Kilcullen and ex-CIA Director Michael Hayden. CIA director Leon Panetta, by contrast, has staunchly defended the drone program as meticulously targeting terrorists. In a war that depends heavily on perceptions, it’s a big discrepancy. There’s more bad news for Panetta and his boss in the White House. A plurality of respondents in the tribal areas say that the U.S. is primarily responsible for violence in the region. Nearly 90 percent want the U.S. to stop pursuing militants in their backyard and nearly 60 percent are fine with suicide bombings directed at the Americans. That comes as NATO accelerates incursions into Pakistan. Just this morning, it announced that a pursuit of insurgents in Afghanistan’s Paktiya Province led to a U.S. helicopter shooting at the militants from Pakistani airspace. Enraged Pakistani officials responded by shutting down a critical NATO supply line into Afghanistan. On the brighter side, wide majorities in the Federally Administered Tribal Areas disapprove of al Qaeda (over three-quarters), the Pakistani Taliban (over two-thirds) and the Afghan Taliban (60 percent). There’s also strong support for the Pakistani army: almost 70 percent want the army to directly confront al Qaeda and the Taliban in the region; 79 percent say they wouldn’t mind if the tribal area were run by the army. Now for the qualifiers. Polling in the conflict-heavy tribal areas is a dicey proposition. A survey last year of the tribal areas published in the Daily Times found that almost two-thirds of respondents wanted the U.S. drone campaign to continue. So either support for the drones has bottomed out or there’s significant methodological discrepancies. The Pakistani firm that actually conducted the new poll of 1000 respondents across 120 FATA villages, the Community Appraisal and Motivation Programme, has polled the area for years. ISLAMABAD (Reuters) - The United States will provide Pakistan with 85 small "Raven" drone aircraft, a U.S. military official told Reuters, a key step to addressing Islamabad's calls for access to U.S. drone technology. The official, speaking on Thursday on condition of anonymity, declined to disclose the cost of the non-lethal, short-range surveillance aircraft, which are manufactured by the U.S.-based AeroVironment Inc.
A company spokesman said the Raven is used by U.S. allies including Italy, Spain and Norway and is one of the most widely utilized unmanned aircraft in the world. The disclosure is another sign of growing U.S. military assistance to Pakistan, a crucial if often tense ally in the U.S. fight against al Qaeda and insurgents attacking U.S. forces in neighboring Afghanistan. The Raven, according to the company website, has a wingspan of just 1.4 meters (4.5 feet) and a weight of 1.9 kilos (4.2 pounds). It can deliver real-time color or infrared imagery, giving troops on the ground an edge on the battlefield. A senior U.S. defense official, also speaking on condition of anonymity, said the Raven drone order is separate from U.S. plans to offer Pakistan much larger, longer-range surveillance drones, a proposition put forward by U.S. Defense Secretary Robert Gates during a visit to Pakistan in January 2010. That offer delighted Islamabad at the time but Pakistani officials say those talks have been held up over complaints about the cost proposed by Washington and a slow timeline for delivery. The defense official suggested those talks were nearing conclusion. "We're in final discussions about which one they really want. They think they want the Shadow," the senior defense official said. Gates had originally offered Pakistan 12 Shadow drones, manufactured by AAI Corporation, a unit of Textron Systems. They are not the weaponized versions being used by the CIA to track and kill al Qaeda and Taliban insurgents in Pakistan but are used strictly for surveillance and intelligence gathering. KARACHI, July 19 (Bernama) -- A Pakistani navy pilotless drone crashed near an oil refinery after hitting a bird in the country's largest city of Karachi on Tuesday,the navy said. A spokesman said that there were no casualties and that the drone had been on a surveillance flight when a bird accidentally flew into the aircraft and it came down in the Karachi suburbs. The aircraft burst into flames after hitting the ground but the flames were extinguished after a short while, reported China's Xinhua news agency on Tuesday. It was the third aircraft crash in Karachi in eight months. Pakistan is developing its own drone technology for surveillance and reconnaissance missions because the United States, which is running a bombing campaign with drones in the country's northwest, refuses to give Pakistan the technology. Two companies in Islamabad, Satuma and East West Infiniti, make drones for the Pakistani military. It is not known if the crashed drone belonged to either company. China's Xinhua news agency, citing local press reports, that the aircraft crashed in the highly sensitive area where three major oil storages are located. Rescue teams were sent to the area to check if anyone was hurt on the ground, police said, adding that the fire fighters rescue team were called to control the blaze after some time, police said. The police sources earlier said they were investigating if it was an act of terrorism as it crashed in the sensitive no-fly zone due to big oil storages. The induction ceremony was held at Pakistan Navy Mehran airbase in Karachi. The indigenously developed drones can be employed in support of Maritime Interdiction Operation (MIO) in the coastal areas. Chief of Naval Staff, Admiral Noman Bashir congratulated everyone involved in the UQAB-II programme and expressed satisfaction on the induction of UAVs. He said the induction was a manifestation of the navy’s commitment and resolve towards self-reliance and indigenization. Earlier, a UAV of the Pakistan Navy had crashed inside the premises of the National Oil Refinery in Korangi. Officially, Pakistan Navy had stated that the ill-fated UAV was a “small remote-controlled aircraft” on a “routine mission” that crashed when it “hit an eagle” during mid flight between 9:30 and 10 am. Officials said that the aircraft had a wing span of around 10 feet which is typically used for target practice. One spokesperson said that the aircraft was almost ‘toy like’ and nothing serious had occurred. However, sources within Pakistan Navy and the local drone manufacturing industry told The Express Tribune that the pilotless aircraft was a mid range tactical UAV called the Uqaab, which is typically used for surveillance missions. The locally-manufactured Uqaab has a wing span of about 20 feet, weighs more than 200kgs and its 550cc engine runs on gasoline. Pakistan Air Chief Air Marshal Rao Qamar Sulema said on Monday that the country is manufacturing its own spy aircraft and will soon be able to prepare pilotless plane equipped with missile technology, local media reported. Talking to reporters at the Shehbaz Airbase in southern Sindh province, he said Pakistan is making unmanned aerial vehicles (UAV drones) at the Pakistan Aeronautical Complex in the town of Kamra near Islamabad, Geo TV reported. Asked if the F-16 aircraft that Pakistan recently received from the U.S. can down American drones, Suleman said that the Pakistan Air Force does not want any such situation. The media people were taken to the Shehbaz Airbase to formally announce that the airbase is now under the complete control of the Pakistan Air Force. The U.S., which used the airbase for drone attacks in Afghanistan and possibly in Pakistan, was told to vacate the base by Pakistan in the aftermath of the November 26 NATO strike on Pakistani posts, which had killed 24 soldiers. The Air Chief said that 14 used F-16s were provided to Pakistan by the U.S. free of cost while 18 others have been bought. The Army Chief General Ashfaq Parvez Kayani said on the occasion that the parliament reserves the right to decide on the resumption of NATO supplies. He said that the final decision on whether NATO supplies will be allowed to pass through Pakistan for forces based in Afghanistan will be made by the Parliamentary Committee on National Security. The Army Chief said that Pakistan and the U.S. are cooperating on defence operations and Pakistani officials are taken into confidence whenever bordering areas are to be attacked. Talking about the Coalition Support Fund, which was set up by the U.S. Congress after the September 11, 2001, attacks to reimburse allies for costs in supporting the U.S.-led war on militancy, General Kayani said that Pakistan was yet to receive 1. 5 billion U.S. dollars from the U.S.
Reports of Pakistan working on producing its own drones began to surface in 2009. The most highly touted model is called the “Burraq”, named for a mythical winged creature that is said to have carried the Prophet Muhammed. Masood said the military is working hard on it, but there’s still no guarantee it will be flying anytime soon. In fact, Pakistan already has a long history of designing and producing drones, many of them created by a man named Raja Sabri Khan. His near obsession with unmanned aircraft started at a young age. Khan found himself compelled to do whatever it took to fund his research. “I augmented my nonexistent earnings by teaching physics and doing fashion photography so these helped Pakistan’s first drones to be created,” Khan said. His clear preference for model aircraft over fashion models carried Khan to the top of his industry. In fact, he said he’s sold his unarmed drones to a company he does not want to name in the United States. Khan said the drones flying in American airspace are being used for law enforcement, security and even search and rescue. But he is adamantly opposed to arming drones because of the risk that innocent people will be harmed. Still, Khan expects Pakistan’s political and military leaders will push ahead, seeing a missile firing drone as nothing more than the latest airborne weapon of war. There is another potential side effect of Pakistan’s determination to manufacture its own drone fleet. Talat Masood said China has become a key partner in the development of the Burraq drone. Masood said the US, which has cooperated with the Pakistani military on joint projects and training for years, should be paying attention. “So you can see how lasting those bonds are. And any country which has a defense relationship which is strong and binding, then the relationship also becomes very lasting,” he said. The attempt forward will be to propose a solution in the form of a UCAV for the PAF. We will first focus on some basic parameters that need to be fulfilled. The focus will then shift to defining a specific solution that meets those requirements in a most balanced manner. In the Grande Strategic view, PAF can use large numbers of J-UCAVs as a cheap and ideal counter for IAF and any other air force that seeks to undermine Pakistani airspace. They could form a picket line that are the first to deal with enemies and are reinforced with manned fighters where necessary. Such J-UCAVs would require very low maintenance, near zero training costs and may be cheap enough to not worry about being put outside hardened shelters, a valued commodity for PAF. Armed with 2 BVRs and 2 WVRs, J-UCAVs could prove to become the foot soldier of the skies, lightly armed and yet overwhelming in their numbers. UCAVs are an emerging technology that has the potential to revolutionize air warfare. While the 5th generation of combat planes is today the pinnacle of military aviation, UCAVs present paradigms that can supplement if not supplant manned fighters of the 4th and 5th generations. People who discuss a potential 6th generation inevitably mention unmanned aircraft as a likely salient. Unlike the 5th generation of aircraft that are extremely expensive and complex to build and maintain UCAVs provide the potential of finding an equivalent solution with significant reduction in complexity and cost. The PAF has until now not considered UCAVs in the air-to-air role. With the systematic addition of net-centric warfare with platforms such as Erieye, ZDK03, ground radars, future planned communication satellite and the necessary middleware for a superior C4I, Pakistan has managed to transform the battle environment to one were UCAVS can multiply the effectiveness and flexibility of the entire air defense system. While nations struggle to keep their 4th generation aircraft operational and can barely dream about 5th generation solutions, UCAVs provide an interesting paradigm shift that cannot be ignored by those entrusted with the defense of their nations and peoples. For some like Pakistan, UCAVs may be the only realistic way to counter a large number of PAKFAs and possibly other 5th generation planes sitting across the border in belligerent India, whose stalwarts dream about “cold starts” and “surgical strikes”, and are only kept at bay by the strength of arms and the courage of the Pakistani soldier; whether on land, in the depths of the seas, or up high over the towering mountains and skies above. Pakistan is on the cusp of joining an elite group of countries capable of manufacturing unmanned aircraft capable of killing as well as spying, a senior defence official has claims. Publicly, Islamabad, which officially objects to lethal drone strikes carried out by the CIA along its border with Afghanistan, says it is only developing remote-controlled aircraft for surveillance purposes. But last week, during a major arms fair held in Karachi, military officials briefed some of Pakistan's closest allies about efforts by the army to develop its own combat unmanned aerial vehicle (UAV). "The foreign delegates were quite excited by what Pakistan has achieved," said the official, who was closely involved with organising the four-day International Defence Exhibition and Seminar (Ideas). "They were briefed about a UAV that can be armed and has the capability to carry a weapon payload." The official said Pakistan wanted to demonstrate to friendly countries, principally Turkey and the Gulf, that it can be self-sufficient in a technology that is revolutionising warfare and which is currently dominated by a handful of countries that do not readily share the capability. "It does not have the efficiency and performance as good as Predator," he said, referring to the US combat drone widely used to attack militant targets. "But it does exist." He gave no details about the capabilities of the aircraft, or even its name. Huw Williams, an expert on unmanned systems at Jane's Defence Weekly, expressed doubts that Pakistan could have succeeded in progressing very far from the "pretty basic" small reconnaissance drones, which the country publicly exhibited at the weapons show, including the Shahpar and Uqab aircraft developed by the state-owned consortium Global Industrial and Defence Solutions. "The smaller systems are not greatly beyond that of a model aircraft," he said. "But the larger, long-endurance drones are a step up in technology across the board." Only the US and Israel are currently believed to have drones that can fire missiles. China and Turkey are also working on large-scale combat drones. Both countries exhibited models of drones at the sprawling Karachi conference centre, which included Pakistani companies marketing everything from guns that shoot around corners to inflatable tanks intended to fox surveillance aircraft. The big claims about Pakistan's developing drone capacity highlights the enormous interest in the technology from armies around the world. "Everyone has been asking us whether our drones can carry weapons," said Raja Sabri Khan, chief executive of Integrated Dynamics, a company that showed off a wide range of small and mid-size reconnaissance drones. "But that's a business for the big boys only." Khan has been deliberately refocusing his company's efforts on smaller drones, many of which are launched by hand, which are mostly intended for civilian use. A Pakistani army colonel attending the exhibition, after recently finishing a tour fighting against militants in the country's border region, said such small drones were a vital tool. Organisers conceded that this year had not been a major commercial success but were pleased with the turnout after the last event in 2010 had to be cancelled. Several exhibitors said Pakistani companies – many of which are directly owned by the country's military – offered a cheaper alternative to developing countries looking to buy everything from tanks to computer simulators used to train pilots. KARACHI, Pakistan — Pakistan is secretly racing to develop its own armed drones, frustrated with U.S. refusals to provide the aircraft, but is struggling in its initial tests with a lack of precision munitions and advanced targeting technology. One of Islamabad’s closest allies and Washington’s biggest rivals, China, has offered to help by selling Pakistan armed drones it developed. But industry experts say there is still uncertainty about the capabilities of the Chinese aircraft. Pakistan first began weapons tests seven or eight months ago with the Falco, an Italian drone used by the Pakistani air force for surveillance that has been modified to carry rockets, said a civilian with knowledge of the secret program. The military is also conducting similar tests with the country’s newest drone, the Shahpur, he said. An unarmed version of the Shahpur was unveiled for the first time at the Karachi exhibition. While Hellfire missiles are said to have pinpoint accuracy, the rockets used by Pakistan have a margin of error of about 30 meters (100 feet) at best, and an unexpected gust of wind could take them 300 meters (1,000 feet) from their intended target, said the civilian. Even if Pakistan possessed Hellfires and the guidance system to use them, the missile’s weight and drag would be a challenge for the small drones produced by the country. Pakistan’s largest drone, the Shahpur, has a wingspan of about seven meters (22 feet) and can carry 50 kilograms (110 pounds). The U.S. Predator, which can be equipped with two Hellfire missiles, has a wingspan more than twice that and a payload capacity over four times as great. Pakistani drones also have much more limited range than those produced in the U.S. because they are operated based on “line of sight” using radio waves, rather than military satellites. The Shahpur has a maximum range of 250 kilometers (150 miles), while the Predator can fly over five times that distance. This country's defense industry is building what companies hope will be a domestic fleet of aerial drones that can take over the U.S.'s role in attacking militant strongholds. The U.S.'s persistent use of armed drones to kill militants in remote parts of Pakistan has created a public backlash that has damaged the relationship between the two nations. But Pakistan isn't altogether against drones. The nation's leaders want to have more control over where and how they are used, and are encouraging local drone makers to build up the country's budding arsenal. "The future era is toward unmanned operations," said Sawd Rehman, deputy director of Rawalpindi, Pakistan-based Xpert Engineering, which builds aerial drones. "The policy of self-reliance is always priority No. 1 of every nation." Instead, Xpert and a small number of other companies are working to develop the country's own fleet of unmanned aerial vehicles—a force they hope will one day supplant the American drones that dominate the country's border with Afghanistan. "We have tried our best asking the United States to transfer this technology to us so we can fight our own war instead of somebody from abroad coming and doing it," said Maj. Gen. Tahir Ashraf Khan, director general of Pakistan's Defense Export Promotion Organization. "Those efforts did not meet with success, so we decided to venture into this field ourselves—and we have gone pretty far ahead." Pakistan's military already uses a small but growing number of unarmed drones, some of them manufactured at home, to monitor the borders, coast and mountain ranges that serve as sanctuaries for some of the world's most wanted militant leaders, including the Taliban and its allied Haqqani Network. Without advanced satellite technology, the Pakistanis are incapable of developing armed drones by themselves now. It will take years, if not decades, for Pakistan to develop a fleet of armed drones to rival America's Predator and Reaper models, many analysts and people in the industry say. To expand its capabilities, Pakistan is looking for help from China, which has marketed its own version of armed drones to developing countries. "Pakistan can also benefit from China in defense collaboration, offsetting the undeclared technological apartheid," Pakistan Prime Minister Raja Pervez Ashraf said at a recent arms expo in Karachi, in apparent reference to U.S. reluctance to share its technology with Pakistan. GIDS produces one of Pakistan's newest and most advanced drones, a medium-range vehicle called the Shahpar that can fly for about seven hours—a fraction of the 40 hours a Predator can spend in the sky. To supplement its nascent drone industry, Pakistan has been working with Italy's Selex Galileo SpA to produce a medium-range Falco drone with limited capabilities that the Pakistani military has been using for surveillance since at least 2009, when the government staged operations against militants based in Swat Valley in northeastern Pakistan. While Pakistan has looked to other countries to advance its drone capabilities, one Pakistani company said it has exported a small number of drones to a private company in the U.S.
Raja Sabri Khan, chief executive of Integrated Dynamics, a Karachi-based drone manufacturer, said he thought the U.S.'s use of armed drones has given the industry a bad name. He aims to help rehabilitate the perception of drones by promoting their peaceful uses, such as the ability to locate flood victims for rescue. "Drones can be used for saving lives, for security," he said. "I'm absolutely against drones for armed purposes." China's acknowledgment earlier this week that it considered using a drone strike on foreign soil to target a major Burmese drug trafficker wanted in the killings of 13 Chinese sailors highlights Beijing's increasing capacity in unmanned aerial warfare. It also foreshadows the dangers of a burgeoning global drone race. Liu Yuejin, director of the Public Security Ministry's anti-drug bureau, told the state-run Global Times newspaper Monday the plan called for bombing drug lord Naw Kham's mountain hideout in northeastern Burma using an unmanned aerial vehicle (UAV) to end a months-long manhunt. China's top drug tsar told the newspaper the drone strike option was eventually passed over to try to capture Naw Kham alive, which finally occurred last April in a joint Chinese-Laotian operation. But his comments reveal that China is weighing targeting killings seriously. Beijing is becoming more willing to project power outside China, moving away from its previous policy of non-interference in international affairs, according to Peter Dutton, director of the China Maritime Studies Institute at the U.S. Naval War College. Another issue is proliferation and skyrocketing demand. While the United States has traditionally exported unmanned drones to only a few of its closest allies, Chinese companies are now seen as an increasingly reliable and cheap supplier. Dozens of countries have bought or built their own UAVs, primarily for surveillance, and military planners see them as extremely effective, both for reconnaissance and as weaponized attack vehicles. "The problem is that this technology is becoming so widely available and so cheap, that I think it is only a matter of time before countries with far smaller militaries, countries with far less responsible regimes, are in a position where they want to use these technologies as well," Vladeck said. American military contractors have been lobbying the government to loosen export restrictions and tap into foreign markets for unmanned aircraft. 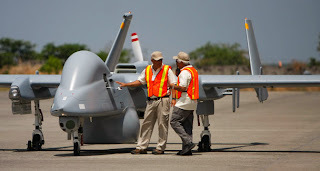 In 2010, U.S.-based General Atomics received approval to sell early, unarmed versions of the Predator drone to Saudi Arabia, Egypt and the United Arab Emirates, among other countries in the Middle East and Latin America. Top drone exporter Israel has sold its aircraft to a variety of countries, including Nigeria, India and Russia. One of the Chinese drones unveiled at the annual Zhuhai air show in November has a range of more than 3,200 kilometers, and the Japanese military recently documented an unmanned vehicle flying near some Chinese naval vessels on a training exercise near Okinawa. With tensions heating up between the two countries over disputed islands in the South China Sea, Japanese media reports have indicated the new government in Tokyo wants to purchase a small number of advanced U.S. Global Hawk high-altitude surveillance drones. While both sides claim the unmanned aircraft will be used for reconnaissance, experts warn adding armaments is relatively easy, and the possibility for regional drone clashes cannot be discounted. JAISALMER: Pakistan's Unmanned Aerial Vehicles ( UAV) called 'Jasoos' have been spying on security arrangements and Army activities going on in the Indian side from the international border of Pakistan adjoining Rajasthan. In the recent past, activities of these UAVs have increased. These UAVs can be spotted at night as sparkling red lights and have become a subject of excitement and discussion among the security forces. They are active even during day time and can be recognized by the trail of smoke they leave behind. These spy planes are active across the border opposite Barmer, Jaisalmer, Bikaner and Ganganagar in Rajasthan. Reliable sources confirming this said that Pakistan is taking help of UAVs to keep an eye on the Indian area and their activities have intensified in the past few days. Sources said Pak had developed UAVs a few years ago with the help of America and Italy and are using them to spy on the Indian area. Sources said these spy planes are active at a height of 1500m-2000m just 500-700 yards from the international border. These UAVs are fitted with ultramodern powerful cameras that can capture photographs of the Indian area spanning many kilometers. They are operated from a distance of 25-30kms. The computer operators are connected to the UAVs and they receive the photographs sent by these drones, the sources said. Though BSF is keeping a watch over the activities of UAVs, but it is not possible to take any action since they are flying within the Pakistani border. But senior officers have been informed about the UAVs, sources added. When contacted Col SD Goswami, defence spokesperson, said, "Our air defence units are monitoring such activities along the border. In case there is an air space violation, suitable action will be taken. All such violations are analysed and taken up with the country concerned through laid down channels as per established procedures." He added that as per the international air space rules and bilateral agreements with neighbouring sovereign countries, such flying activities are permitted 10 km away from the international border, but any closer than the 10 km limit requires prior permission. Jasoos are unmanned aerial vehicles (UAV) developed by Pakistani company Satuma. They are controlled via remote and weigh around 20kg. Capable of doing 180 kmph, these UAVs fly at a height of 10,000ft (3480m). Jasoos have a range of 100km, and can fly for 4-5 hours continuously with battery backup. Pak air force in the year 2004 had included UAVs, but was used in 2009 after the testing. Prior to this, Pak had purchased UAVs from Italy in 2003. The armed forces announced on Monday that they had inducted the very first fleet of unmanned aerial vehicles (UAV) in the Army and the Air Force. According to a release from the Inter-services Public Relations (ISPR) announced that the first fleet of strategic drones, ‘Burraq’ and ‘Shahpar’, had been inducted into the forces. Both of the drones were produced indigenously. “In the future these UAVs could also be gainfully employed in various socio-economic development projects, as well,” it added, hinting at the possibility of using drones in non-combat settings and for civilian use. General Kayani, while appreciating the work of NESCOM scientists and engineers, highlighted that induction of indigenously developed surveillance capable UAVs in Pakistan Armed Forces is a force multiplier, and will substantially enhance their target acquisition capabilities in real time. Pakistan’s military unveiled two domestically produced drones Monday, even as the country is facing growing protests over U.S. drone strikes on Pakistani soil. “Shahpar can carry about a 50-kilogram payload and has around eight hours endurance. Burraq, based on CH-3 specs, would carry around a 100-kilogram payload and 12 hours endurance,” he said.